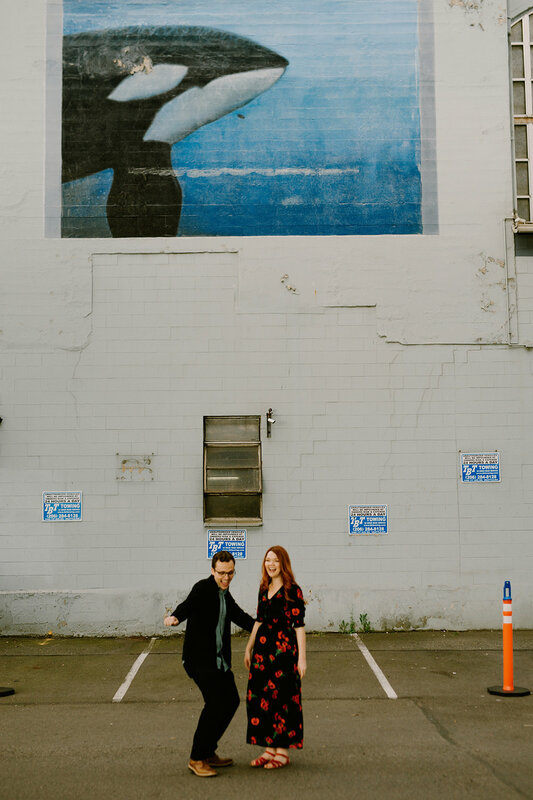 I can't decide if I broke any fashion rules in our engagement photos. I've been staring at this blank page for awhile now, not knowing how to start because did I break rules, or didn't I? Does this outfit have any significance for me? Do I feel good in this outfit? In 30 years, will I look back at what I wore and feel warm fuzzy feelings, and not eye-rolling feelings? As you can see, fashion rules didn't make the cut. Let's jump into the lab for the rest! THE BROKEN RULE: I've heard rumors that when being photographed or filmed, solid, saturated, colors are best. In both my outfits I wore pattern, and in one I wore black, so, perhaps, that is the rule that I broke. THE OUTFIT(S): My first outfit was my favorite dress. It's black, poppy-print (my favorite flower!) and makes me feel like a mystical fortune teller and I'm all about it. (I've worn it on the blog here, and allllllll the way back at the beginning, here.) I added my red saltwater sandals, for a little bit of Joan-action, and was ready to go. The second outfit was more romantic. Christian and I both wore what we were wearing the night he proposed. (Read about the proposal here!) He wore different shoes, and I wore a different, more flattering, top but mostly our outfits were the same. THE EXPERIENCE: The best kept secret about wedding planning is that it can be pretty tedious. The first few months were mostly sifting through vendor contracts and staring at our budget spreadsheet - not really the epitome of glamour or romance. As Carly pointed out, being engaged is a short, unique time period in our lives, and I'm so glad we took the opportunity to photograph it. I think these photos really capture how Christian and I are together, and I don't think I could love them any more! THE CONCLUSION: I am no "What to Wear in Engagement Photos" guru. I have to say, however, I think my criteria are pretty good. 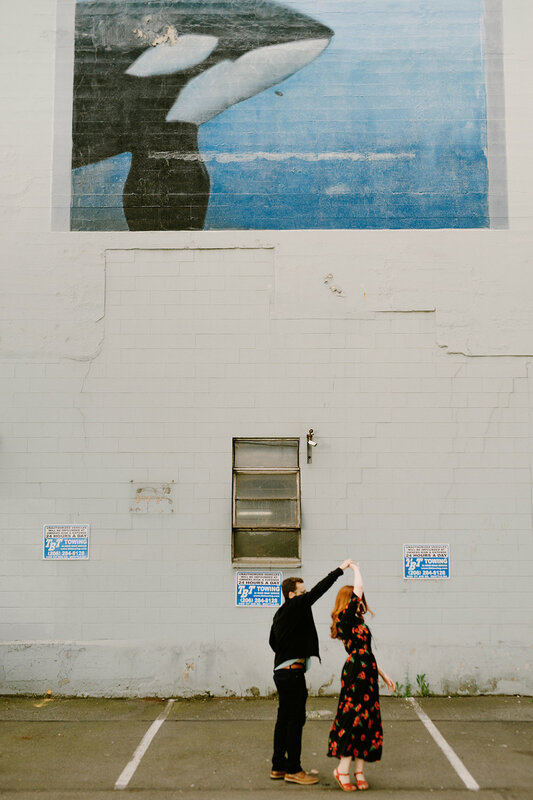 The internet is full of how-to's, but for me, what was most important in our engagement photos was that I felt like myself. I may or may not have broken rules. I definitely did wear sandals usually worn by children. I wore multiple patterns and was pretty covered up, but I felt great and I looked like myself. So, that's a win in my book. I hope me in thirty years still agrees. How did you choose your engagement photo attire? I'd love to know! I'll be back with another post on Sunday, but until then, I'll be fashion-experimenting on Instagram. Come say hello! Also, make sure to check out our photographer's website. Carly's work is beautiful. Every picture in this post is linked, or you can just click here. Happy Wednesday! We're halfway to the long weekend!